At age 16, while living in England, Ionie Bergs was doing the paper rounds to make some extra cash. Because her father had died of a heart attack at only 38 years old, Ionie began reading up on nutrition. She dreamed of someday starting a healthy restaurant. But instead of going the culinary route, she chose business school. Ionie worked in different restaurants around London before moving to Sarasota. Here, she learned to give massages, ultimately becoming a masseuse. But the entrepreneur soon realized if she truly wanted to live well, she’d need more than just massage – so she set about creating a center for total health and wellness. IONIE – the wellness retreat and cafe – was born. At first, she thought she was healthy because she actually cooked all her food instead of “buying it in tins,” and chose organic meats over fatty varieties. Next, she eliminated meat altogether. Now, she doesn’t even use an oven. That process is very labor intensive – Ionie cuts no corners when it comes to food and wellness. Everything, including the cheesecake, is no-bake. In addition to her raw food cafe, her wellness center offers daily yoga, oxygen detoxifiers, sauna and acupuncture. Ionie loves the place she has made – helping people to get healthy and stay that way. Her ultimate goal is to heal people with food. Her food is so good, you’d never even know there’s no cheese or sugar in it. Here, you’ll only find ingredients that grow from the ground. Everything is made in-house, and all the recipes have grown quite organically from the staff’s constant experimenting. 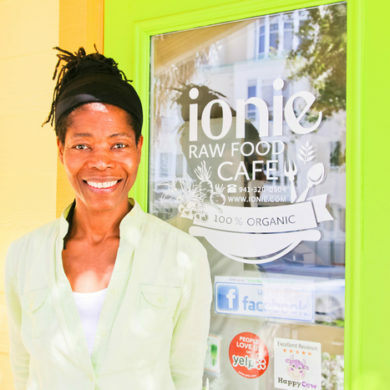 Take the first step at Ionie Raw Food Cafe, located at 1241 Fruitville Road in Sarasota FL. For more information, visit the Ionie website or call (941) 320-0504.